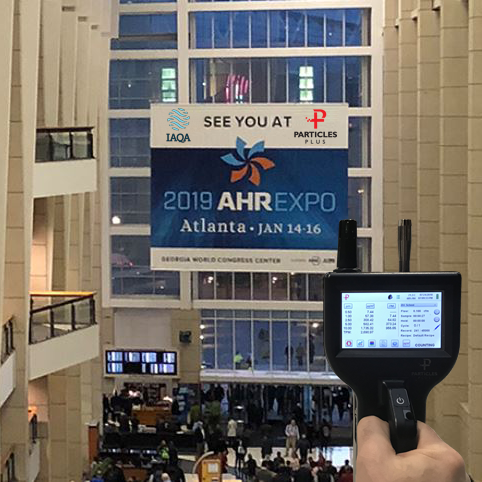 Atlanta, GA – January 14, 2018 – Particles Plus will be exhibiting at the 2018 AHR event at the Georgia World Congress Center and attending the 2019 IAQA Annual Conference as their Diamond Sponsors this week. This will be the company’s 4th year as a key sponsor of the Indoor Air Quality Association. The company will be there to support the education and improvement to the indoor environmental professional market and to promote their line through demonstrations of their particle counters and air quality monitors. The parallel events will allow attendees to learn more about the range of affordable, Grade A, air quality monitors, like the 7302-AQM and the 5302-AQM shown by Particles Plus. These monitors integrate 10 channels of sensor information for particulate, temperature, humidity, CO2 and TVOC monitoring. The instruments can provide multiple, simultaneous PM monitoring information without the need for additional impactors or multiple instruments. They also support the Internet of Things protocol to allow for remote access and cloud-based monitoring services. For more information on Particles Plus Air Monitoring Instruments and their applications, or for technical questions, product specifications or pricing, contact Particles Plus today.